"If you will increase the circulation of The Coming Nation to 100,000, it will leave a surplus of nearly £5,000 a year. This money will buy 3,000 to 4,000 acres of land. Those who send in 200 subscribers or more, or con­tribute as much, will be the charter members, who will proceed to organize the colony on such bases of equality as in their judgment will produce justice. Each man and each woman shall have an equal voice, no matter how much or how little they may have contributed. The land shall be selected by this committee, and the title vested in all. The land should have at least railway facilities convenient; good water, soil, stone, wood or coal. When work­men have erected houses for themselves, and a place for The Coming Nation office, the paper, plant, and workmen will be removed there, and will form the nucleus for the employment of the colony. All receipts of the paper will go to the common fund. The store will be owned by the whole people, and goods sold at wholesale price, plus cost of store­keeper's salary. Everyone must be free to do as he or she wills, so long as in so doing the equal rights of others are not infringed." The circulation of the paper having consider­ably increased, 1,000 acres of land. were pur­chased near Tennessee City, Tenn., as the future site for the colony. In the spring of 1894 "calls" were sent out to a number of those who had complied with the requirements. The first present member of Ruskin to reach the colony ground was a man named E. B. Lonsbury, who arrived on the proposed site of the new Utopia on the night of June 29th, 1894. He was guided to the spot by a land agent, and found it nothing more than a deep ravine, thickly wooded. Lonsbury was a Socialist to the backbone, but he was tempted then and there to go back home and read about Socialism rather than endeavor to prove it in an actual community. It was time to plant, but there was no ground to plant in that was not covered with trees or shrubbery. There was no water to be obtained within half a mile - absolutely nothing for man or beast to eat or drink. Not a rosy outlook, certainly, for the future of the "coming nation." Lonsbury watched the head of the ravine for the appearance of his brother pioneers, who came, one by one, to survey their future settlement, and by July 1st there were on the ground men of the following trades; 1 carpenter, 1 machinist, 1 barber, 1 shoemaker, 1 baker, 1 wire-nail operator, 1 butcher, 1 cooper, 1 blacksmith, and 1 laborer. These men erected a building for the printing plant, dug a ,well, and otherwise prepared for the reception of the printers and printers' outfit, as well as for their own wives and children. On August 11th The Coming Nation went to press in its new quarters with a circulation of 50,000 copies weekly. As soon as this work was finished attention was immediately turned to the cultivation of the land. The clearing of the wooded slopes of the ravine was a very arduous performance, and many laughable incidents are recorded by those who were with the colony at that time. The woods were overrun by hogs of the "wind-splitting" kind. One day, as the men were sitting at dinner in their tent, one of these bold foragers of the forest ran in and actually seized a man by the arm in its attempts to secure a portion of the food. The Socialists, however, refused to co-operate in this manner, and the animal was unceremoniously kicked out. The next difficulty experienced was that of organizing a co-operative association. No State at that time had enacted laws for the charter­ing of such corporations as the colonists then had in view. Before the end of October, how­ever, this difficulty was successfully surmounted, and certificates were issued to thirty-five share­ holders, who had paid in various. amounts -­ besides having in many instances secured sub­scribers for The Coming Nation. Everyone now set to work with a will, and by July, 1895, some twenty-five to thirty houses were erected. It soon became evident, how­ever, that it would be impossible for the asso­ciation to prosper unless a more attractive and productive location could be secured. Some will ask, no doubt, why this point was not more fully considered earlier. It must be remem­bered, however, that the then proprietor of the paper which gave birth to the idea was but a theorist - not versed in agriculture or in the purchasing of land. It appears he went to Tennessee City, and, on the advice of a land agent, negotiated for the tract. 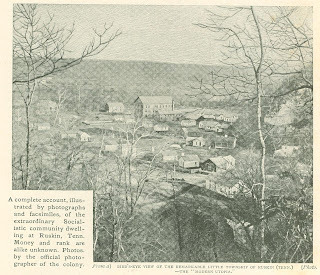 The little band of hardy pioneers did the wisest thing under the circumstances, and sent out committees to view various localities in Kentucky, Pennsyl­vania, Eastern and Western Tennessee, and other points. 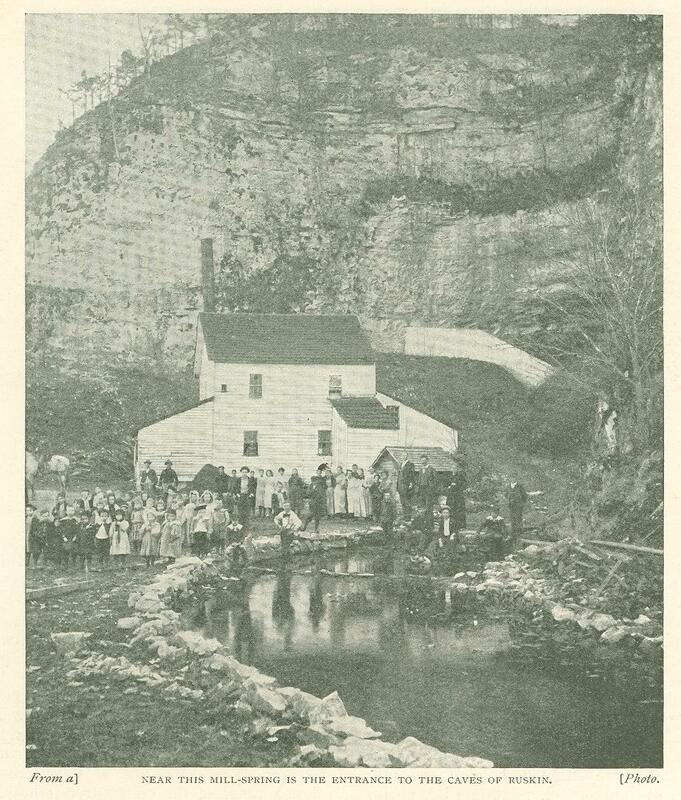 In February, 1896, a farm of 384 acres of excellent land, not far from the present site, was purchased in the Yellow Creek Valley, and the colony began to migrate thither. Shortly after this a second farm was secured, the whole forming a very desirable property, well watered, and possessing many other advantages. Are you willing to do any useful labor when there is nothing for you to do in your chosen vocation? Do you believe that all members should have the same pay for the same hours of labor if they do the best they can? What works on, social problems have you read? Define Socialism. Define Communism. Define competition. What is your object in seeking to become a member of this association? If admitted to membership, to which would you attach the most importance - your own individual interests, or the perpetuity of the association? How long have you entertained these views on the co-operative mode of life? The application is then posted on the bulletin board of the colony where it remains from Monday morning to Saturday afternoon, which is an election day, and a half-holiday. The poll is open for two hours, and if the applicant obtains a two-thirds vote of all the ballots cast, he is duly installed as a member of the community provided he is prepared to take up a share of stock. This latter means the payment of £100 in cash. As no installment system is now in vogue, the poor, hard working individual without means has but little prospect of becoming a member of this co-operative community. But what advantages will a member gain? ­this is naturally the next question. It will not take long to show that these are numerous. He will be guaranteed work every day that he is able to work, and pay for every day that he is sick. He is given a house and lot free, and is not troubled with taxes, for these are paid by the associa­tion. His board, laundry, medical attendance, and shoe repairing cost him nothing; while his children are also fed and educated by the association. All that he has to buy is house­hold furniture and the clothing his family wears. Should a member ever wish to leave the colony at any time he may do so, when the associa­tion invariably return his share of stock, without increment, though according to its by-laws he cannot force the association to purchase his share of stock. But a general description of Ruskin as it is today and of the daily life of its members will convey a far better idea of the doings and workings of this remarkable community. A six mile drive from Tennessee City brings one in sight of the colony, which is finely located in a beautiful valley, bounded by high limestone bluffs or cliffs in some places, and in others by gently undulating hills, partially clothed by forests. The photograph on page 261 is a birds­eye view of the colony, which was taken in the month of January, and this accounts for the naked appearance of the trees. Not much imagination is required, however, to perceive that the Socialists have chosen a very picturesque spot. Altogether there are nearly seventy small white washed wooden houses grouped about the large printing building, the largest residence being the "Bachelors' Home," occupied by thirteen unyielding celibates. 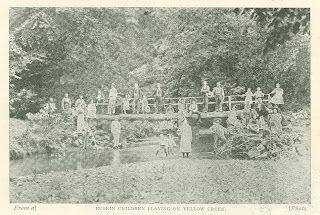 After crossing Yellow Creek, which is shown in our second photograph, we enter this "earthly paradise," where all are equal and competition and strife unknown. The first thing to strike the visitor would probably be a large three storied building, with its numerous windows and massive proportions. It is called the "Printery," and can be very well described as "the heart of the colony." Here is printed and published The Coming Nation - a wonder­ful Socialistic newspaper, which boasts of having the largest circulation of all other papers of its kind in America, if not in the world. Its mailing list is a lengthy one, containing over 30,000 subscribers. Inside the building one is shown the Campbell web printing press, which has a capacity of 12,000 copies per hour. The Coming Nation, a facsimile of which we reproduce on page 262, is a purely Socialistic news­paper. It is well got up, and consists of four pages; it can boast of quite a num­ber of signed articles. "Under the Searchlight," the editor (Mr. Herbert N. Casson) gives two columns of interesting reading, very cleverly writ­ten, touching, in a Social­istic strain, on many of the leading topics of the day. Under "Colony Notes" we learn much interesting local news, while there is also a lady's section and a children's column. The paper is issued weekly, and the yearly subscription is 50 cents. Adjoining the "Prin­tery" is the boiler house, which furnishes power not only to the Printery, but to the steam laundry, and also to the sawmill close by. 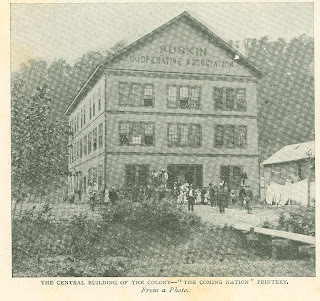 To see the Ruskin teams bringing the paper to the printing house, and the immense building, would give one the impression that the production of the paper was the chief industry of the colony. There are, however, numerous other industries in a flourishing con­dition - especially that of cereal coffee, which has found a large market outside the colony. The colonists also manufacture leather sus­penders of a style which for ease and durability require a lot of beating, and the demand for this class of goods is constantly increasing. They also make leather belts, and their costume tailor department is rapidly increasing its outside trade, while the works they publish on re­form subjects are innumerable. Life at Ruskin is very regular and methodical. At 5.30 every week day morning a steam whistle awakens the sleepers. At six o'clock it is heard again, announcing breakfast, and again at seven o'clock, telling its inhabitants that the day's work has begun. No one is allowed to shirk this call to duty, not even the president, Mr. Allan Fields, a very pleasant man, who enjoys the full confidence of all the members of the community. From twelve to one is the dinner hour, when all the members of the colony may be found at the" Printery," partaking of the midday meal. To save expense and also labor they dine together. The third floor of the big building has been specially set apart for this purpose, and has a seating capacity for 250 persons. It is, indeed, a grand sight to watch these hardy pioneers of labor partaking of their midday meal, with a kindly, frank courtesy towards each other which plainly bespeaks their full confidence in their belief that equality alone brings true happiness and contentment. The fare cannot be said to be a sumptuous one, but it is wholesome, well cooked, and chiefly the products of the farm and garden. The flour used in the baking of the bread is ground in their own mills, from wheat raised on the farm. At 5 p. m. the whistle is again heard and the day's work is over. The currency in vogue in Ruskin is undoubt­edly unique. But money of any kind is seldom wanted, for all life's necessities are free. There is, nevertheless, a system of money called the "maintenance," which is paid every week to all workers. It is in the form of coupons, and its value is noted by the hours of labor performed. The specimen we reproduce herewith of this curious "money" is a one-hour check, and entitles its receiver to purchase anything from the community store to that value. This store. has probably the most remarkable price list in the world. Every member is entitled to draw checks to the value of twenty-five hours each week, while his wife may also draw the same, for both men and women are paid on the same scale; and their children also may earn checks to the value of ten hours each week. On more than one occasion, however, the colonists have voted to stop the maintenance money when any heavy debt has been staring them in the face; and members have even been seen to tear up their checks when any obligation has suddenly had to be met. 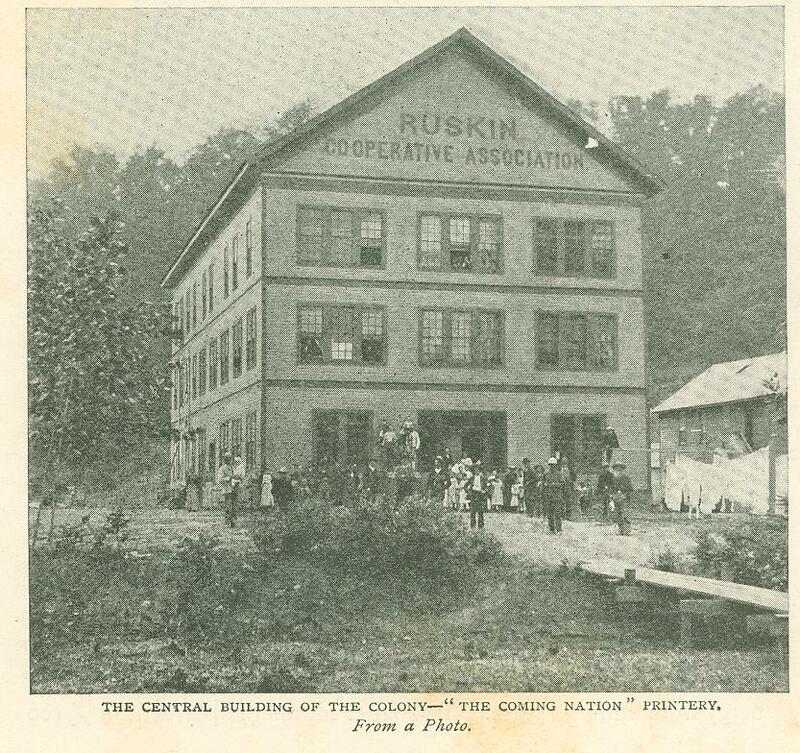 At present, however, the Ruskin Co-operative Association is in a very flourishing condition financially, with every prospect of its continuing so. Indeed, so prosperous has the colony become that it is now erecting a college, which will be known as the College of the New Economy, and our photograph shows Mr. Henry D. Lloyd, a well known figure in the Socialistic world, addressing the colonists at the laying of the cornerstone. 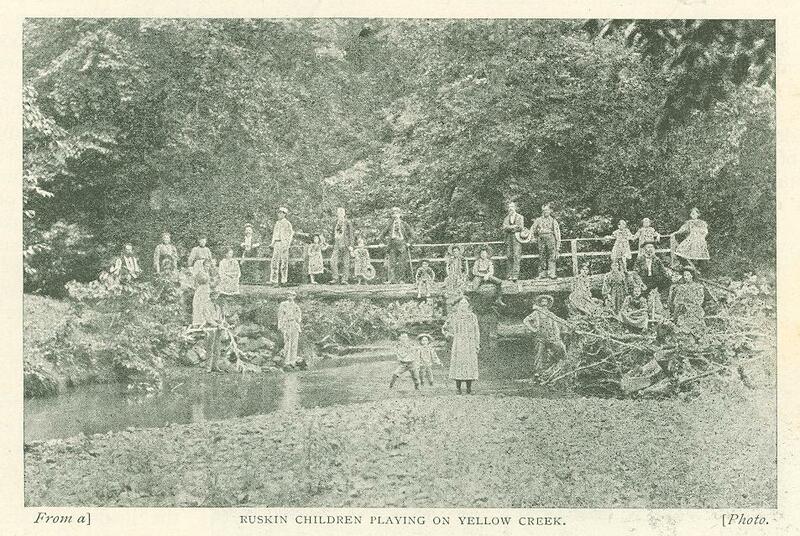 Ever since the colony was founded the training of the young has received careful consideration, and it is not going too far to say that the child­ren of our great civilized cities can take many lessons from the bright, intelligent children of Rus­kin, who are both obedient and well behaved. The colony can also boast of its masters who have gone to teach in the school at Ruskin, and among them we notice the name of Professor Broome, who was sent as a commissioner to the Paris Exhibition, and who has now been teaching the young Socialists of this modern Utopia the fine arts for more than three years past. He has also established a pottery, and more recently has completed a life like bust of Ruskin, which is a masterpiece of art. And for this kind of labor he is entitled to the same privileges and receives the same amount of maintenance money as the man who plants beans in the associa­tion's kitchen garden! It must not be supposed that the members of the colony suffer from ennui. Amongst the young people there is a society called "The Progress League," which meets every Monday evening, and gives very good entertainments, while there is also the Ruskin Dramatic Club, whose members display very good amateur talent. There is also a library of over 1,000 volumes, which is well patronized. Briefly, then, this is the financial, artistic, musical, and social side of life at Ruskin. It may come as a shock to some good people, however, to learn that there is no church in the colony, and what is more it will never have one. The members believe that a church would kill the scheme. To establish a commonwealth of equality and socialism among people divided on theology would be impossible, and so the erection of a place of worship is not allowed. The colony does not prohibit its members from worshipping, however, and on Sundays many of them drive to the nearest outside churches or chapels to attend Divine service. The establish­ment of a drinking saloon, too, is also prohibited. To describe with any degree of minuteness the forty different trades or departments which exist would be impossible, but it is pleasant to note that most of them are in a prosperous condition. They are all under the supervision of a foreman, who is elected by vote in the same way as the president and other officials, and who watches over his department with exceeding care, making a monthly report to the association of business done, for which he is entitled to the same wages as the lowest man under him. The farm is the chief outdoor industry, while the kitchen garden and orchard, with its choice varieties of all kinds of fruit, is by no means a small concern, supplying as it does most of the table wants of the colonists. The cattle farm can boast of a well-fed herd of cows. Mention might also be made of the chicken ranch, with its 800 head of chickens, most of which are pure bred Plymouth Rocks; the pig farm, with its 160 head of Poland China swine; as well as the bee farm - all in a thriv­ing and healthy condition. The greatest natural wonders of Ruskin are its caves. They are well worth a visit, and the colonists allude to "our caves" with much pride. They are situated beyond the mill, shown in the photograph reproduced herewith, and here also can be seen the spring. We are tempted to stop and call attention to the group of children seen in this photograph, so healthy and bonny do these rising young Socialists look; and it cannot be gain said that life in this remarkable commonwealth does not agree with them. What is known as the "Big" cave is both picturesque and useful. 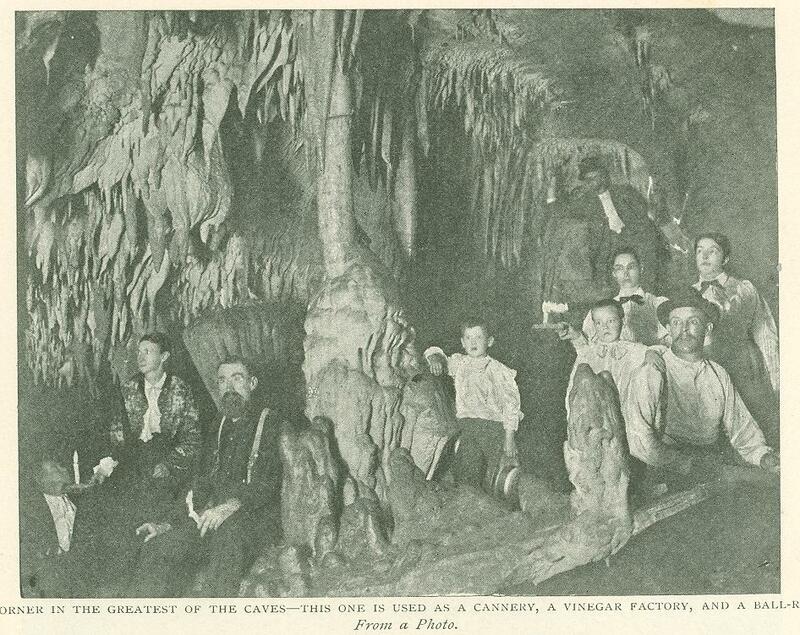 It is now used as a cannery and vinegar factory, and some idea of its immensity may be gauged from the fact that on July 4th last the colony gave a "barbecue" and dance in the cave, which was attended by over 2,000 Tennesseeans - more than 1,000 of them being in the cave at one time. There are numerous passages leading from the big cave into many others, some of them being large and not yet properly explored. The most wonderful of all, however, is the stalactite cave. A whole chapter might be devoted to detailing the many wonderfully odd and curious shapes of the crystal formations to be seen here. By dint of perseverance the photographer of the colony (for it has its own photographer, and our views represent beautiful specimens of his handiwork) has secured a photograph of this cave which gives but a faint idea of its many beauties. It makes a strange but interesting picture, showing some nine members among the various crystal formations with candles in their hands. 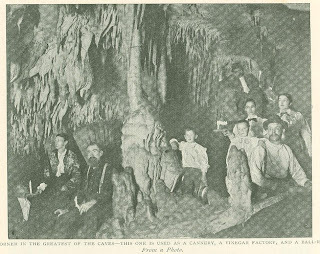 The atmosphere of the caves is exceedingly pure and dry, and many happy hours do the colonists spend in exploring their wonders after a day's labor or on Saturday afternoon. Originally published in the Wide World Magazine. June 1899.